Nige Robinson has paddled, surfed and coached throughout Europe, North America and Papua New Guinea, where he just happened to pick up a gold medal in the 1999 World Sea Kayak Championships, and has over 25 years experience in sea kayaking. He is a British Canoe Union (BCU) Level 5 Surf Coach, a Level 5 Sea Coach and formerly Coaching Development Officer for the Welsh Canoeing Association (WCA). He now runs courses from his home in Pembrokeshire where he was born and brought up, and most of his life has been spent close to or on the sea, either kayaking, surfing or sailing. Whilst working with the BCU and Canoe Wales Nige was responsible for co-writing and implementing guide-lines and accreditation for BCU centres. He was also a member the British Canoe Union Sea Kayaking Technical committee. Previously he has worked as a part time inspector for the Adventurous Activities Liscensing Authority and the Wales Tourist Board. This experience allows him to offer expert advice on risk assessment, operating procedures and technical matters for many aspects of kayaking and canoeing. 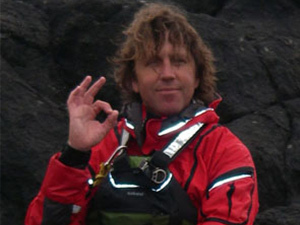 Martin Leonard has been sea kayak guiding in Pembrokeshire for over 12 years. 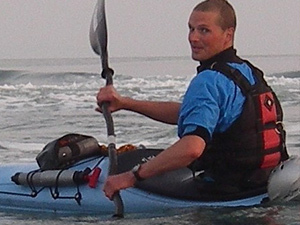 He is a British Canoe Union Level 4 Sea Kayak Coach as well as a Level 3 canoe and Inland Coach. He has worked in all aspects of the Outdoor Industry and for some of the largest and most respected outdoor providers in the UK. This experience shows in his consummate professionalism and sound approach to safety and adventure. Martin has paddled across the globe including Iceland, Norway, Central and South America, Nepal and New Zealand. When Martin’s not in a sea kayak he spends his time…. well… in the sea! Whether kayaking, Coasteering or Surfing, the Pembrokeshire coast is both his office and his playground. Martins’ wealth of experience, passion for the outdoors and relaxed style allow him to offer a complete experience to anyone heading out onto the sea with him, sharing his extensive knowledge of local conditions, wildlife, geology and history. Ben Fothergill was born and raised in the wild west of Wales. From a young age he has been out adventuring with family and friends. He has spent most of his life in or on the sea and playing in the mountains and rivers of this amazing country. 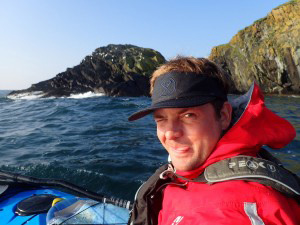 Ben has worked in Pembrokeshire for the last 5 years as an adventure guide for numerous adventure providers. Alongside his passion for sharing with others the wonders of the outdoors Ben has continued to work self-employed as an ecological surveyor and studied Ocean Science for an undergraduate degree. Ben currently holds his 5 star sea kayak leadership award and is currently working his way through the coaching awards to gain his Jedi status (like Nige and Martin). Ben as paddled and adventured his way around parts of the U.K. and further afield to New Zealand, the Seychelles, Maldives, United states, South Pacific and Greenland. In his spare time he’s mostly found surfing around the U.K’s wild coastline or hitting the crags and mountains with his adventure buddy/wife Rachel. We had a great Trip around Skomer with Ben, amazing wildlife and spectacular scenery with some wavy bits for excitement. Cant wait to come back. Sian S.